Learn to bring Community Coaching into all elements of community planning! 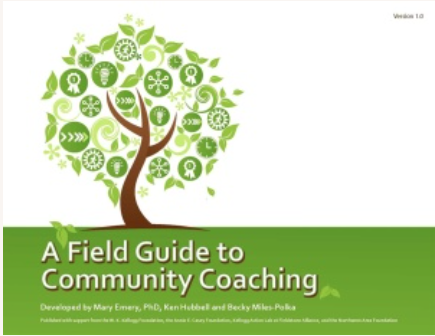 This online workshop is part four of the series and helps with conceptualizing community coaching as an integral part of community programs, strategic planning, and community change. All of these processes are about planning, action, and evaluation. Community coaching can provide a framework to build a continuing feedback loop to keep communities moving forward. Conceptualized as an effort to help CYFAR programs reach the goal of sustainability, this five-part series introduces you to the basic elements of community coaching, provides a framework for putting community coaching into practice, provides individualized feedback on specific goals and issues, highlights emerging tools to capture coaching at work, and provides a holistic view of program planning and capacity building that uses coaching to keep momentum going from planning to implementation to evaluation and back again! Discussions and activities will focus on the role of community coaches to guide results, reflection, and reach among community groups who demonstrate readiness for and relationships to support sustainable community change.